Irfan alam of Begusarai district in Bihar started off with 100 such rickshaws in 2007. Today, over three lakh rickshaw-pullers from across the country are registered with Sammaan Foundation . While 10,000 and odd are pedalling the special rickshaws, the process is underway to benefit others. Now US President Barack Obama called him to attend the “Entrepreneurship Summit” scheduled for April in Washington DC. Irfan Alam, the founder and chairman, SammaaN Foundation came out with an innovative idea and transformed it into a business model. It relates to the cycle rickshaw pulling business where the men engaged hardly made a respectable earning. Alam’s idea made it profitable and honourable with small but innovative changes. In Alam’s business plan, rickshaw puller makes the ride for the commuter more comfortable and enjoyable with provision of music, magazine/news papers, and even first aid. He designed the rickshaws in such a way that it gives ample space to put the advertisement on the side, front and back panels of the rickshaw. Rickshaw puller additionally earns from various value-added services such as sale of mineral water, juices, mobile recharge, courier collection, bills collections. 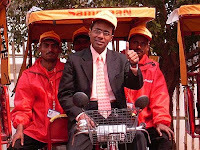 The company intrudes for the first time prepaid rickshaws in India. gone thru news regarding your issue with the web service provider. Web services are yet to mature enough. Most of the time web service providers don't provide enough details to customer and rather blackmail them. Feel sorry bcoz i m also in the same trade but i keep high level of transparency. I never met u but i remember there was an enquiry by ur associate regarding foundation 1-2 year back. Hope u will get ur recent problem resolved asap. Salaam Mr. Irfan..I am Chintamani Vaidya from Faridabad, Haryana and would love to have a conversation with you related to the cycle rickshaw. I can be reached at +919818602150.